Not an overly exciting topic for most but these heeled black boots are all gorgeous and I'm pretty into every pair so for me they're worth talking about. I really need to buy some new black boots before my go too fringed heeled boots die thanks to being over-worn. Donning my wood block high heeled boots on an almost daily basis is a favourite habit of mine and I'd like to continue to do it so why not add to my shoe collection. 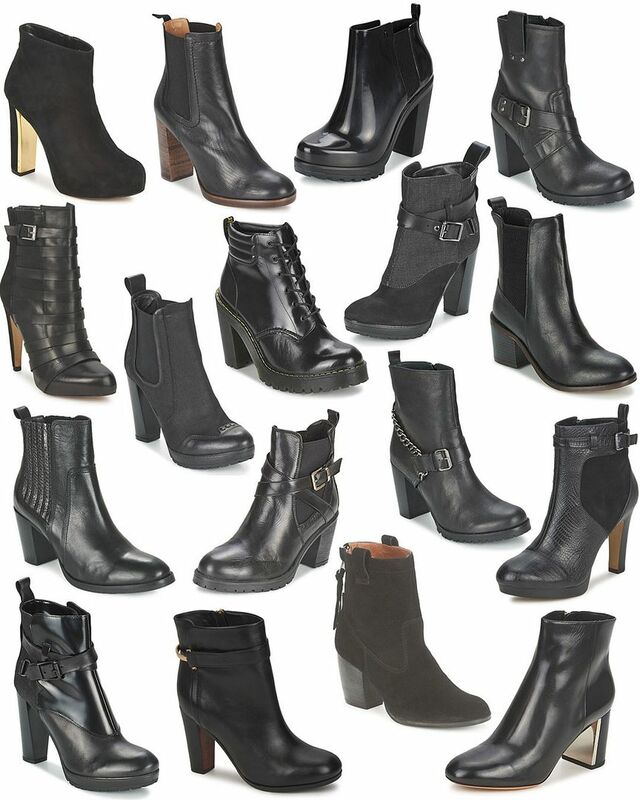 I'm looking for something slightly edgy, a little different from the standard boots everyone is wearing and taller than the average ankle boot too. The gold inner heel detail is gorgeous but I'm also loving buckles, chains and wraps at the moment so picking out one pair from all of these I found on Spartoo is going to be difficult! These boots are from brands like Sam Edelman, Bronx, French Connection, Betty London, Carvela and my ultimate; G-Star Raw. The rubber-like pair at the top are Melissa and the lace ups are by Dr Marten which are awesome, it's just so hard to choose. Send help!